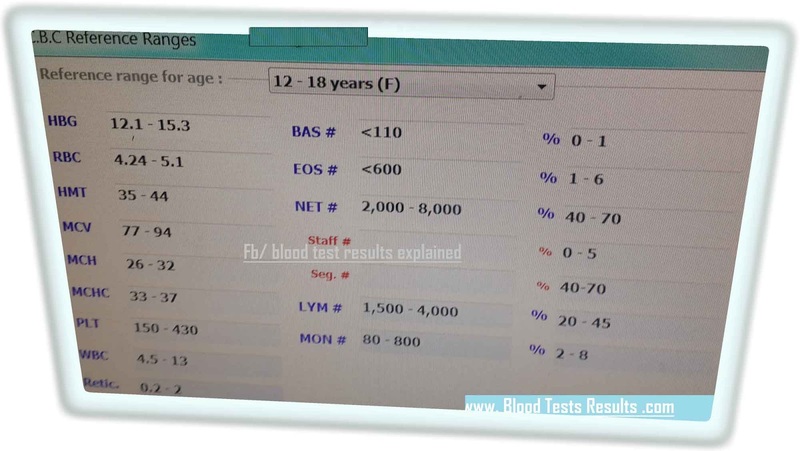 Teenager CBC normal values chart explain how much cells are found in a blood sample of 12-18 years old female, how much hemoglobin should be in her blood, what is the normal white blood cells count and what is the normal WBCs shape, as well as how much blood platelets which is normally found to help body seal the wounds. Values are according to universal guidelines. What is the meaning of normal reference ranges in my teenager daughter’s CBC test? The reference chart has mentioned the safe blood cells counts especially for teenager female which is 12 to 18 years old. Not a wide difference between teenager male’s cbc and teenager female’s cbc reference numbers. Note that: teenager female who have got a women period will normally show anemia in their CBC test which directly seen in the hemoglobin and RBCs values in her CBC results, loss of blood through the female period cycle cause a decrease in RBCs count and thus reduction in hemoglobin values. Also, teenager female are exposed to various vaginal bacterial infection which may abnormally elevating white blood cells values than normal limits. Have your daughter’s results?, please do not hesitate to visit my page “ask specialist” or Fb page.